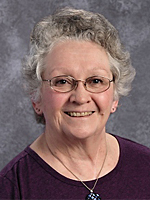 Nancy started teaching at Columbia County Christian School when the school opened in 1999. She currently teaches sixth grade science, as well as middle and high school life science, earth science, biology, physical science, and anatomy and physiology. In addition, she teaches math and Bible courses as needed. Nancy is a USAF Veteran. She is married to Dennis, and they have three married children and twelve grandchildren.